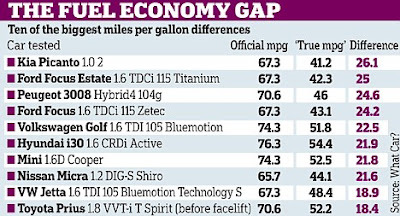 One pattern is clear among the top ten offenders: They are high MPG vehicles. But this region of high efficiency is the one in which gas consumption differences are in fact small. The following two tables use the data from WhatCar? posted at this site to calculate gas consumption measured as gallons per 100 miles or GPHM. 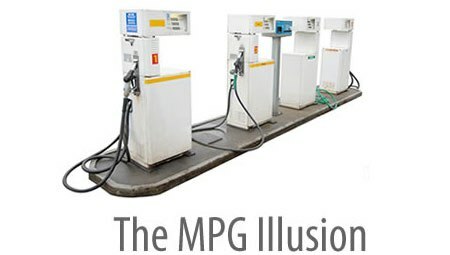 The tables are sorted by difference in MPG from largest to smallest. The first table shows that, if you trust the True MPG number, the Kia Picanto is a big offender whether you look at MPG or consumption (GPHM). However, the table also makes clear that the next ranked car changes depending on the measure. GHPM shows that the Ford S-Max, which is 27th in MPG difference, is second in difference in consumption, overstating gas savings by .88 gallon per 100 miles. The EPA revised testing procedures for new cars about five years ago, and MPG measures in the US are by and large fairly realistic. However, fuel consumption ratings in the EU do appear to be systematically optimistic.